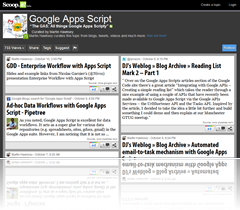 For a while I’ve been curating ‘The GAS’ which is a collection of Google Apps Script examples and news pulled together using scoop.it. I started it mainly because I’m a ‘patterns programmer’, that is I have limited formal coding skills so learn and produce things from other people’s examples. Because others getting started with Apps Script may also benefit learning this way I’m advertising the link here. I also want to keep adding to this resource and while scoop.it has some nice article discovery searches I’m aware that I’m missing a lot more. So if you have found or made an Apps Script example you would like to share in The GAS there are a couple of ways you can do this.